Both stages are required to be completed to become CFCE certified. The candidate is required to demonstrate their knowledge of the CFCE core competencies​ and practical skills by successfully completing the peer review, practical and written examination instruments. The Certification policy can be found here. You are assigned a coach to guide you through the problem’s learning points. Must pass all four problems to be eligible to enter the certification phase. Entry into the Certification Phase is automatic once the peer review phase has been completed. The candidate will have 7 days to begin the hard drive problem and 40 days to complete it. The 40 day clock will begin 7 days after the peer review phase has been completed whether the candidate logs in or not. The candidate will then go directly into the Knowledge Based test, which consists of 100 general forensic knowledge questions. The written exam consists of questions composed of true/false, multiple-choice, matching, and short essay (fill in the blank) questions. Candidates must obtain a minimum score of 80% on the exam and practical to pass. Failure to achieve the requisite score will result in failure, and the CFCE certification will not be awarded. The CFCE program is an independent process that candidates must complete independently. Once both phases have been successfully completed, candidates will be required to complete a notarized form declaring that the practical examination and written examination were completed without assistance from anyone. The form must be completed and returned to the CFCE Certification Chairman (or designee) prior to issuance of the CFCE certification. The first and last name and certification ID number of each certified CFCE member will be listed on the IACIS public website. Candidates failing either the practical examination or written final examination will not be re-examined immediately. The candidate can re-take the practical or final written exam in the next certification cycle. IACIS will allow each candidate to be re-examined one time without charge (practical or final examination). Failure of both parts in the Certification Phase will be a failure of the process. You only get to take one of the two over. The requisite fee for any subsequent re-examination will be based on the fee schedule approved by the Board of Directors and posted on the IACIS website. Candidates enrolled in the peer review phase are prohibited from discussing any matters related to the peer review phase with anyone other than their assigned coach, regional manager, division administrator, Peer Review Chairman, or Director of Certification. Candidates enrolled in the certification phase are prohibited from discussing any matters related to the certification phase with anyone other than the CFCE Certification Chairman or Director of Certification. Violation of this clause may result in the candidate’s immediate dismissal from the certification program. Cheating, plagiarism, egregious policy violations, or unethical conduct will result in immediate dismissal from the certification program and will be referred to the Ethics Committee for possible revocation of IACIS endorsed certifications. 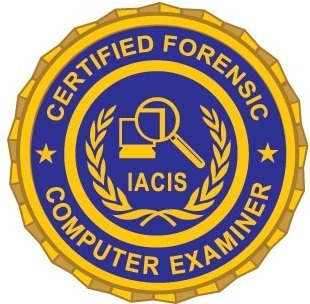 Only a current CFCE certificant is permitted to identify themselves as being a Certified Forensic Computer Examiner or use the CFCE logo.